Nate Vander Stelt serves as the Executive Vice President for GACX. 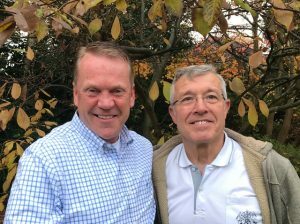 The leadership of GACX, a global alliance for church multiplication, and the Global Church Planting Network (GCPN) have signed a Memorandum of Understanding (MOU) on intentional collaboration. This agreement enables the two networks to avoid duplication of efforts, maximize utilization of resources, and coordinate the planning and execution of essential global, regional and national gatherings. It builds on the shared goal to plant a multiplying, missional church for every 1,000 people​ worldwide. GACX Executive VP Nate Vander Stelt (left) and Steff Nash, GCPN Network Facilitation Team Leader, celebrate the agreement. In 2018, the leadership of GACX and GCPN will meet ​regularly to pray, monitor progress, discuss practical ways to collaborate and encourage each other in the shared work of the Great Commission. Through this announcement, members of both networks are encouraged to intentionally collaborate toward fulfilling the task to which the Lord Jesus has called us. Please join in praying for the Lord to guide and bless this collaboration so that we may make our highest contribution ​to the fulfillment of the Great Commission.